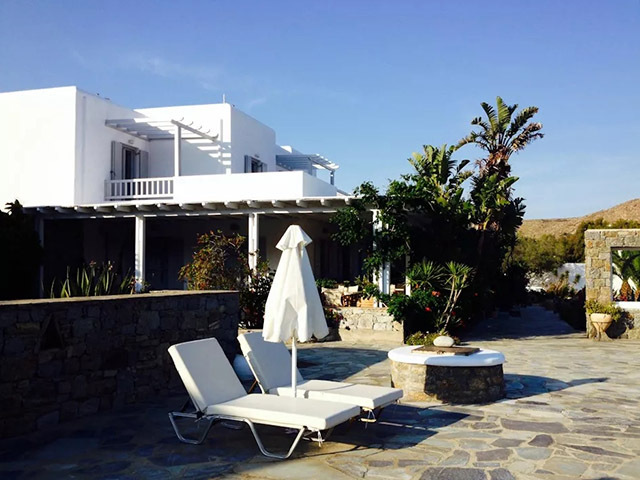 Welcome to Sunrise Mykonos Hotel at Agrari Beach. 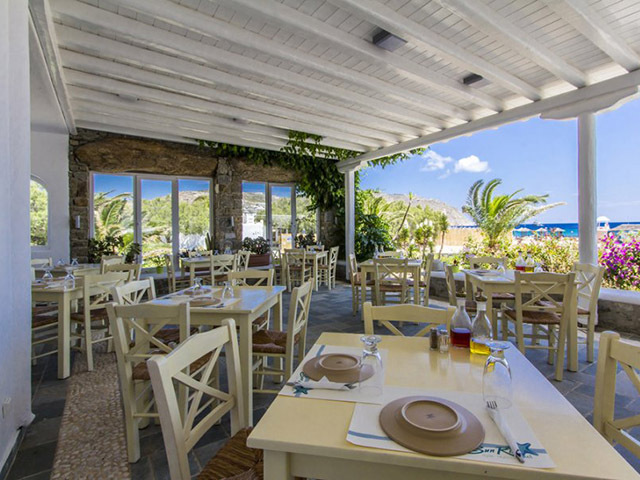 The outstanding location directly on the beach in combination with the family atmosphere, characterize the uniqueness of this resort. 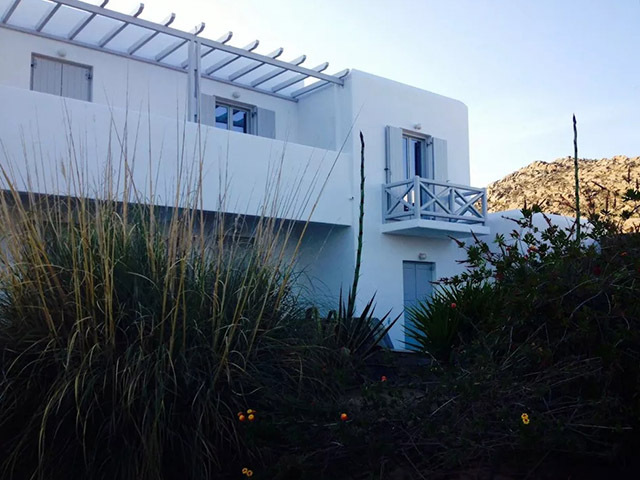 Blue and white colours that consist the interior design, will reveal the simplicity of our traditional architecture. 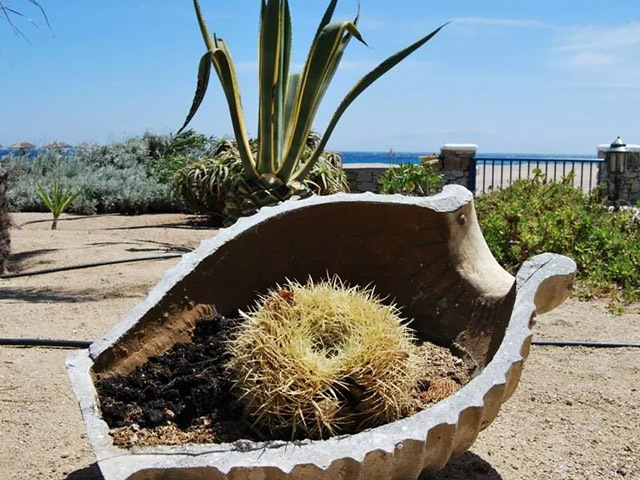 Let yourself free while enjoying the sandy and quiet beach of Agrari, the endless blue of the Sea, the peaceful crash of the waves, and the warm rays of the sun. 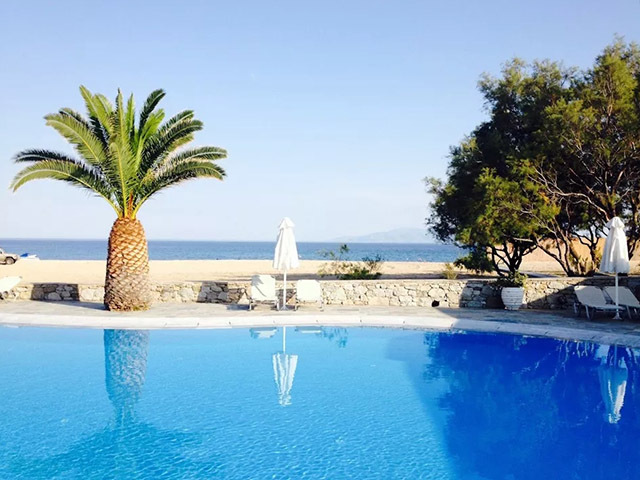 As our hotel is family-run, you can experience the sense/meaning of Greek hospitality with a personalized service. 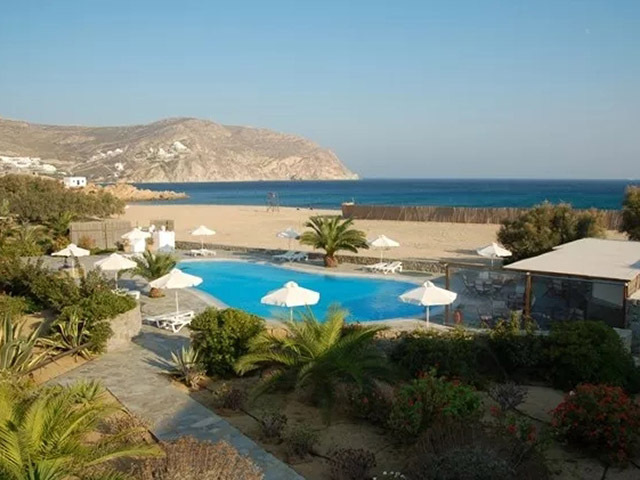 The hotel’s main feature is the outdoor salt water swimming pool, where guests are surrounded by panoramic views. 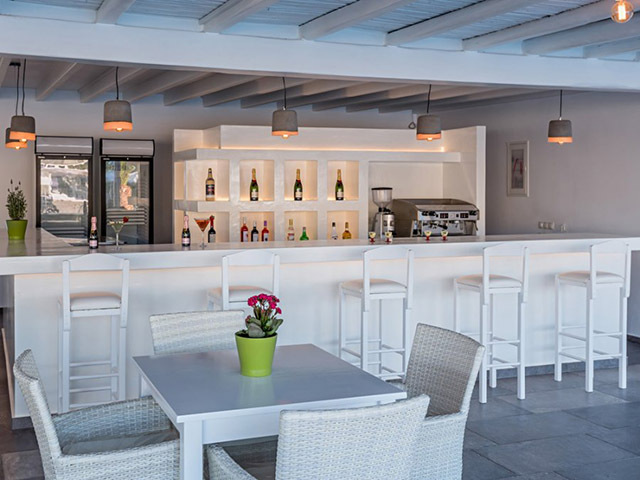 There is a pool bar located here where refreshing cocktails and homemade Mediterranean delights are being served. The hotel also offers guests a fitness room for keeping up with their workout regimen. Other amenities include car and bike rentals, shuttle service, complimentary parking, wireless internet access, baby sitting and business service. 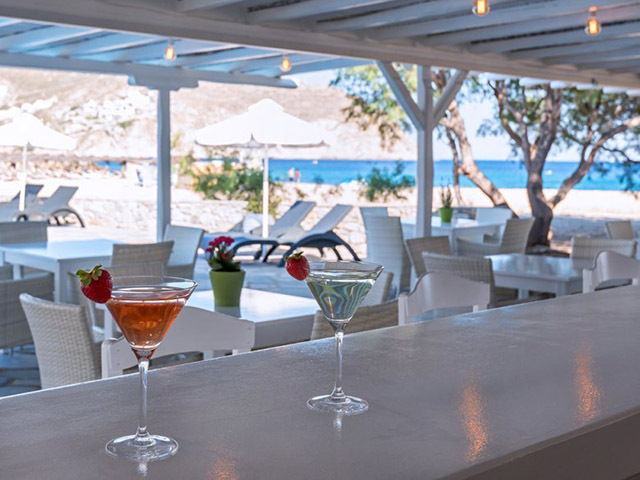 Active pursuits from water skiing to yoga classes and massage service, whether your vacation is action packed or more relaxed, the world of Sunrise hotel includes temptations of all interest. While adults enjoy the shimmering waters of the idyllic beach of Agrari, children can have a wonderful time at the outdoor playground. 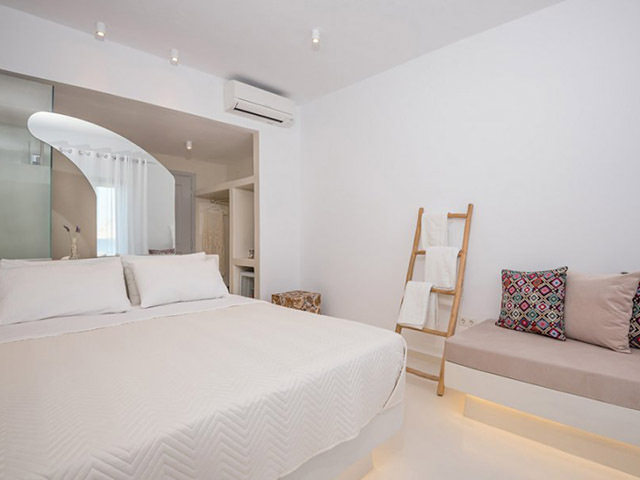 This is a double room with an extra bed for a child or adult. 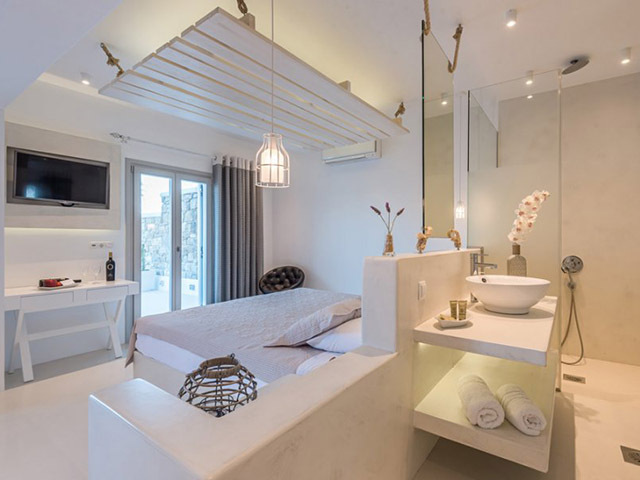 Offering sea views and a shower with hydromassage jets, this air-conditioned, newly built room comes with a minibar and a flat-screen, satellite TV. 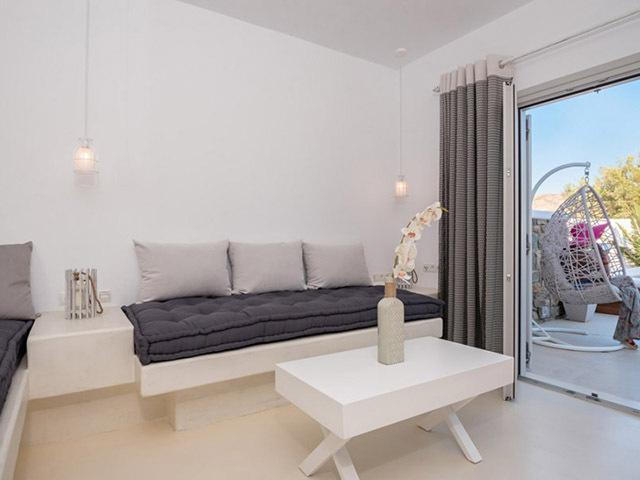 This spacious suite opens to a 30-m2 terrace with panoramic views of the Aegean Sea. opens to a balcony with sea views. It has a minibar and a satellite TV. 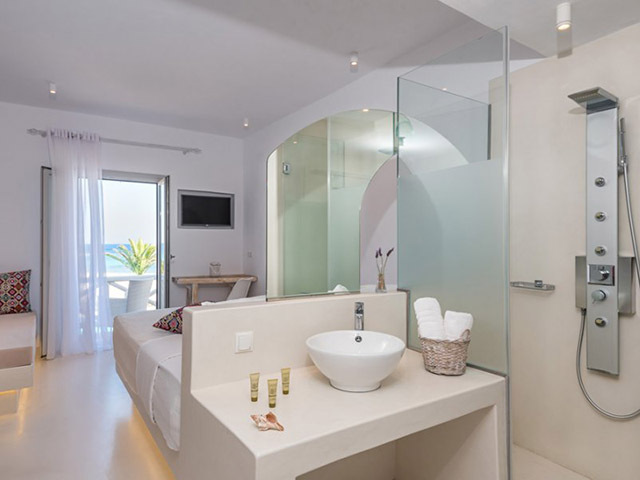 Offering sea views and a shower with hydromassage jets, this air-conditioned room comes with a minibar and a flat-screen, satellite TV. 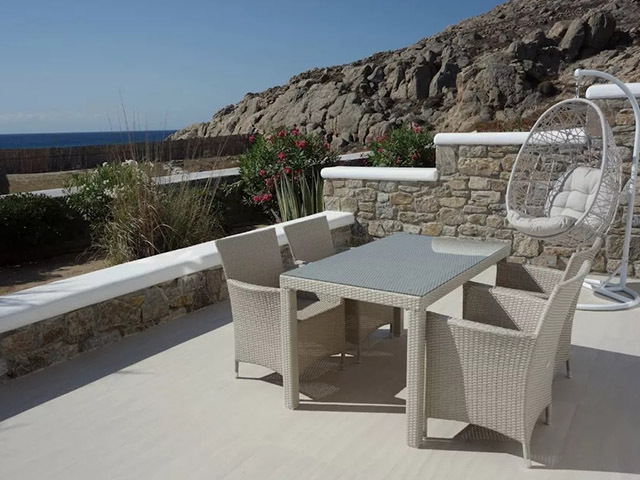 Mykonos is one of the top Greek destinations, well-known for its nightlife, its transparent beaches and its crystal clear waters. Agrari, Elia, Lia, Platy Gialos, Paradise, Kalo Livadi are just some of the beaches where swimming, leisure and sports can be combined. There is never enough time to explore this paradise… Some of the most interesting places are Little Venice with its magnificent sunset view, the church of Panagia, the pitoresque Windmills, Matogianni Street with its famous fashion boutiques and Delοs the sacred island of antiquity. Open: May to October ... 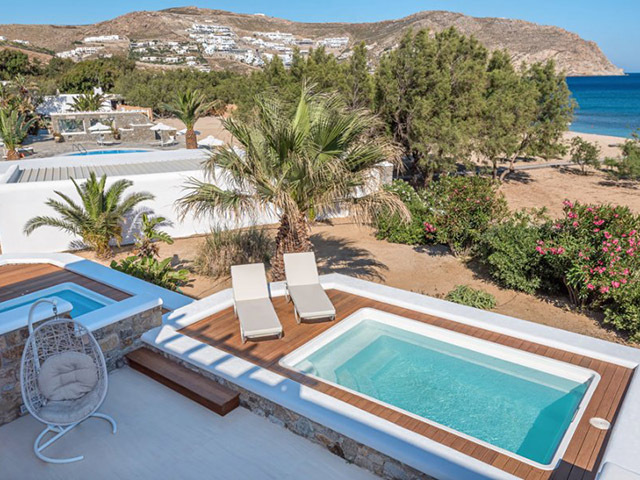 Welcome to Sunrise Mykonos Hotel at Agrari Beach. 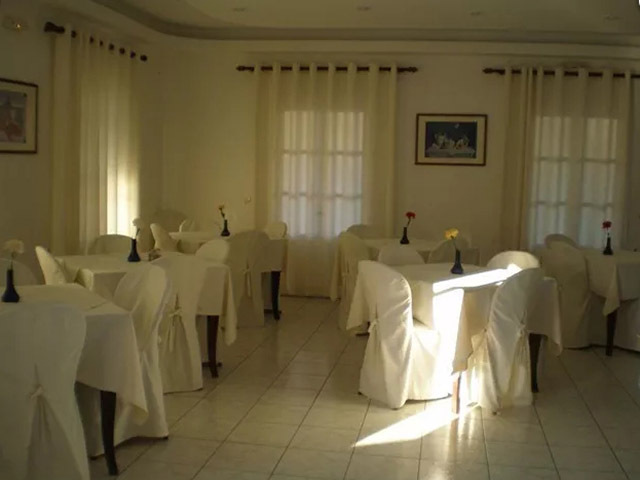 The outstanding location directly on the beach in combination with the family atmosphere, characterize the uniqueness of this resort.